We are delighted to support an online survey for interpreters working sometimes or regularly with international sign. The survey is part of my Maya de Wit’s dissertation (PhD project) at the Radboud University in Nijmegen, the Netherlands. The survey is in English and International Sign. The aim of this survey is to get a better understanding of the profile of interpreters working with international sign. 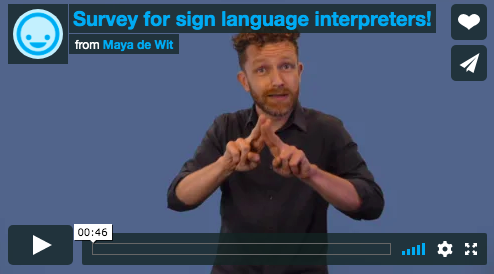 If you are a sign language interpreter working with IS, we encourage you to take part in this survey. Please take note that the survey is open from 1st April to 30th April 2019. We thank our colleague Maya for choosing, among others, the efsli network to launch her survey.